I love making wreaths. I think they are so cute and they don't have to be hard to make. Sometimes the cutest wreaths are very simple. 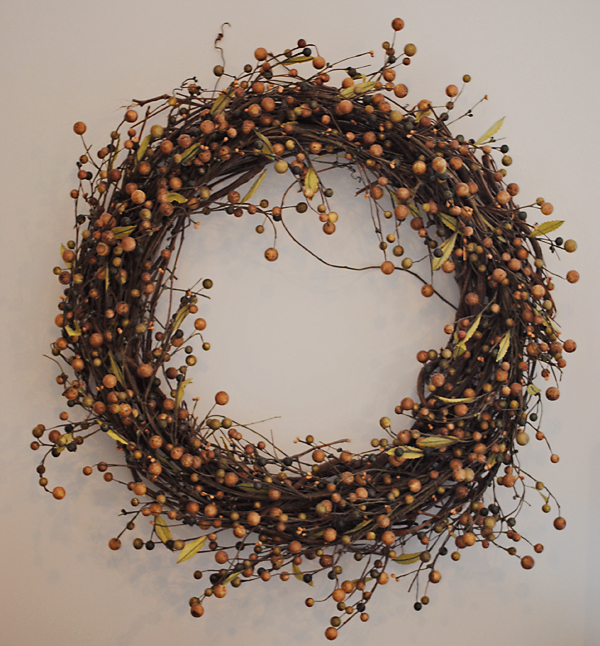 One of the easiest ways to make a wreath is to find a garland of something that you like and hook it to a wreath... I found these little berry garlands a couple years ago at Tai Pan and kinda went crazy with them. I have them in my decor, I use a few strands of them on my Christmas Tree, and then I decided to make a wreath out of them. 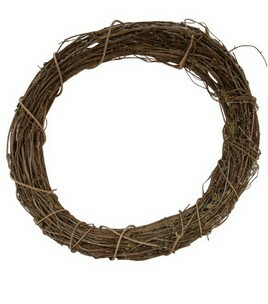 So I bought a grapevine wreath (looks like sticks) at Hobby Lobby with a 50% off coupon. Then get about 3 or 4 garlands, depending on how full and how long the garlands are. At first I tried wrapping the garland around the wreath but it was getting to be too bulky and I was running out of garland fast so I decided to bend the garland to make a circle on the face of the wreath. Every couple inches I would take one of the little individual berry strands and wrap it around a part of the wreath to secure it. No gluing involved and technically if I wanted, I could take the garlands off the wreath and use them for something else since they aren't glued to it. If your garland isn't wired then you could get some florist wire and use little pieces of that to secure your wreath to the branches of the wreath. Hi Ashley! I found you through FamilyEverAfter, and I love your blog!!! Your yellow dress in the picture is adorable!!! Thanks for sharing your crafts!!! I love wreaths and do a similar one for our front door that changes with the season. So much fun!